Saturday Grooves . . . Who Is On Your Elevator? . . . These last few weeks I've been thinking a lot about personal growth and change (you know, as a Life Coach does . . .), and particularly "The Change Cycle". If you need a refresher course, you can pop over to Martha Beck's site to read more here. More specifically what I've been pondering is Square Two of the Change Cycle - where we find ourselves post-catalytic event, post-cocooning and starting to envision what our new life might look like. We change our wardrobe, we change our hair, we redecorate our living spaces . . . "reordering our outer situation to reflect our inner rebirth". <--- I just love that description so much!! I look back on the times in my life when I've made big changes to my hair (no really! ), and sure enough, I was coming out of the fog of some serious life changing event. See Exhibit A below . . . WILD! Yep - I used to be BLONDE!! In fact, there were times in that blonde to brunette era that I didn't even recognize myself. Which was fine I think - moving from a version of me that didn't work into a better situation where I felt more like myself . . . it's bound to happen. But what happens when you start to feel disconnected from your friends and family, and they don't recognize you any more either . . . THEN what? ​Martha Beck has an analogy for this too . . . it's called the "Empty Elevator Syndrome" - which she discusses in her book "Steering by Starlight". "When you dissolve false beliefs that once held you prisoner, people around you can't stay connected with both the New You and their old patterns of behavior. Without meaning for it to happen, you may find that many of your relationships will simultaneously fall away, leaving a space for new loved ones you haven't yet encountered. The elevator is going up a level. For a little while, you have to ride it alone, or nearly so." Oh yes - it's true. Sometimes working through times of profound change can alienate relationships you've had your whole life! So all of this is to ask . . . how are you handling big life changes these days? 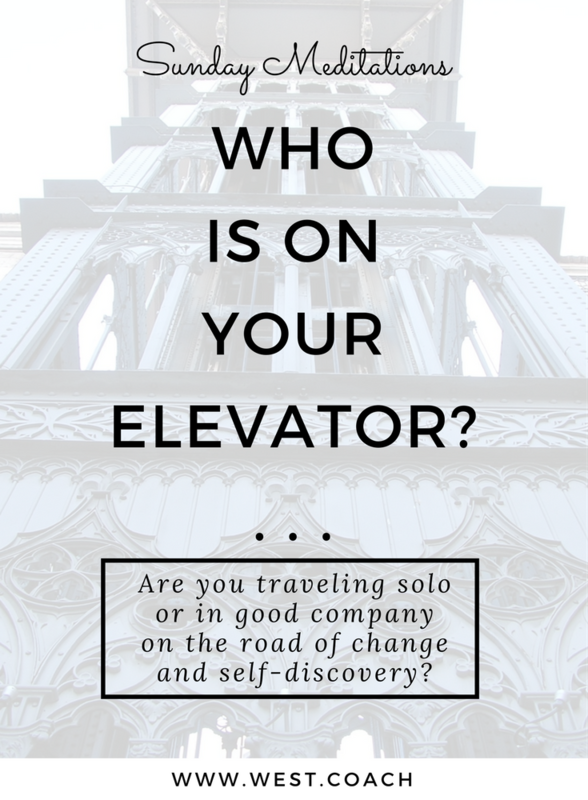 Are you riding solo on your elevator? Or are some of your tribe keeping you company - supporting you on your journey of personal development and new-you-ness? I'd love to know more - send me a note or leave a comment below! As for me? I have an appointment next week to get my hair done. Change . . . it's a good thing! So true and beautifully stated. Thanks!